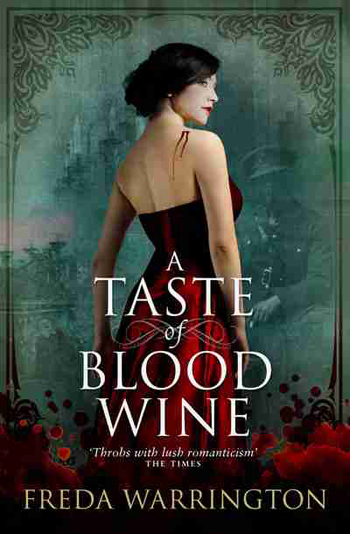 Freda Warrington’s A Taste of Blood Wine is the first in a series, and of a subgenre you’d think would feel tired, worn out, even (dare I say it?) bloodless. The sweeping gothic period romance. Even describing it summons images of Jane Eyre meets Twilight. Which proves unfair in the end. To be sure, a Byronic vampire hero falls in the love with a disregarded, less glamorous yet extremely intelligent young woman. Both try resisting an intense mutual attraction, but fail. A covert affair commences. Dark forces gather. Our hero’s nature offers a barrier to their love that seems all but impossible to breach. All seems the stuff of a hundred other tales, doesn’t it? But then, what could be more cliche than Romeo and Juliet, a story harken back at least as far as ancient Greece? Aren’t by their very nature murder mysteries nothing but formula? Folks disagree on how many plots actually might exist–anything from three to seventeen–but certainly the number remains finite. So why tell any tale? This author gives an answer to that: Specifics! Warrington in this novel weaves her own believable world of the undead, a backdrop for genuine individuals rather than cardboard cutouts. Karl von Wultendorf, our vampire hero, hails from the Age of Enlightenment and finds himself (as so many did) seeking some kind of answer in the wake of the First World War’s horrors. Rebelling against the psychotic narcissism masquerading as Faith with which master vampire Kristian brow beats his flock, Karl seeks out ways of science, hoping to real knowledge. The Neville family, whose patriarch works diligently in attempts to learn the secrets of the physical world, become a beacon of hope to him. Charlotte, the shy middle sister, becomes rather more. One of the many ways the writer could have descended into cliche lies in the character of Charlotte. Many another author has taken this idea and created a single-dimensional ‘good girl’ whose love and loyalty prove redemptive. Or made her a wallflower simply awaiting the right catalyst to turn into some avatar of Wonder Woman or Lara Croft! But Charlotte Neville proves more complicated. By far. And for that reason more realistic. Her shyness and discomfort with vanities and social events gives rise to shame–with barely concealed contempt on the part of her family members. As we delve deeper, we learn the fount of such feelings. Charlotte, far from being a frail but misunderstood beauty, realizes only too well in her heart lies a splinter of ice, and in her spine the potential for steel. Unusually for a vampire tale that shies not away from the horrors of being a human predator, our heroine will actually prove a very good hunter of humans. Yet she’s not evil. Or at least no more evil than humanity in general. Likewise Karl has reached a strange equilibrium in his undead state–the fruit of a history we feel yet never learn too many details. What we discover proves distressing enough! Unlike (for example) Dracula, Warrington’s vampires severely weaken their victims every time they feed. Even if only taking a few swallows, the person who feels a vampire’s bite nearly always descends into madness or eventual death. To muddy the ethical waters as well as keeping us on Karl’s side, we have the spectacle of vampires far less ethical than Karl himself–most especially the cruel but fragile Illona and the demagogue Kristian, who regards the undead as God’s own children, with guess who as His chosen prophet? Adding to this is some genuine predatory behavior on the part of some vampires (or perhaps all, if need be) including a form of dominance that rings very true–that of one vampire draining another to make them submit. It works! Or it would, if only they didn’t retain enough humanity to rebel, to wish to live their lives as individuals rather than members of a pack. A Taste of Blood Wine also manages a fairly impressive couple of feats very nearly effortlessly–or looking effortless, which seems more important (and skillful). For one thing, we have an impressive number of characters–the Neville family (five members at least), friends (at least four), and the undead (at least six). Having that many characters doesn’t rate as so odd, but that we easily distinguish between them most certainly does! The fact a few of them are of the same class and age and position in life yet retain their individuality earns kudos, at least from me. Most vampire novels frankly fall back on character types than actual characters. Not here! Likewise many ignore mortals in favor of the undead, which often robs them of an essential tension–that between mortal and immortal, living and undead, prey and predator. If either fail to achieve reality, the story ultimately suffers. We don’t care. But if we care for both–then that tension keeps us on the edge of our emotional seat. In this Warrington succeeds! Should you enjoy a sweeping tale of genuine gothic romance, laced with existential questions and emotional scope, I highly recommend this book!